Perhaps many will find it ironic that in this day and age, I would dedicate a significant amount of resources into stationary and personal writing instruments. Coupled with this fact, that my online presence and academic writing is usually focused upon mobile devices, apps, and social media, many may find this personal habit obtuse. The mess of my writing. Generally, I enjoy writing online (as seen in this blog) and the means to share my thoughts whether through online outlets or social media is a great means to reach a large audience. But perhaps that is the thing: Some things I do not really want to share at times. It's ironic. In this day and age where privacy is a prime concern, and yet many share every single thought or idea online, we turn back to old mannerisms to record our private moments and musings. For me, the feel of a good journal (subjective, I know) under my hand with a great pen (again, subjective) between my fingers, is a supreme delight. 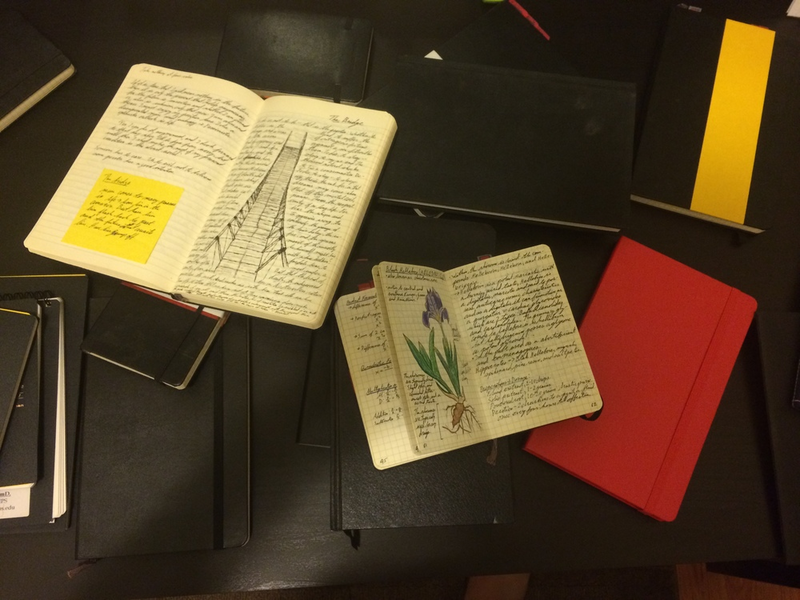 I have kept personal notebooks, journals, sketchbooks since my teens, and it's always a reflective moment to look back at past writings and see what my thoughts were. Within the past decade, I have developed my handwriting, accumulated multiple theme notebooks, and dabbled in amateur art amongst the pages. However, my writing has changed, as I have moved on from my formal education to my so called professional life in academia, my notebooks have also taken a different tone. Now they are a way for me to lay out projects, jot down ideas, and flesh out new research ideas. Other notebooks layout meetings and group projects, and have turned more-so into documentation I would not want to upload to the cloud. So why not just use my online areas to write? Well, some ideas I want to develop further prior to formally writing it up for the public to see. The other thing, and maybe you have this problem too, is that I tend to let the thoughts that develop in my mind drive my keyboard strokes more loosely than when I write by hand, which usually has a more pensive moment and allows me to consider what exactly goes into that word on paper. Perhaps its because I write with fountain pens, and that by putting such thoughts to paper, there is no backspace. What is written is finished, and must stand. Somedays, I think its a form of mindfulness meditation, and gives me time to reflect further than I would had I been blogging or tweeting. Doing so requires a bit more thought I feel. And for that reason, I will continue to write by hand and keep my journals, so that I can retain such experience and practice a bit of patience in my thoughts. Moleskine - I am no hipster. Wait, maybe I am. I don't like PBR though... in any event, these journals have become ever so popular. I remember finding them in a Borders Book Store in 2002, and I have stuck with them ever since. I have a pretty diverse collection of pocket to desk size journals by this point. Maruman - These journals are manufactured in Japan, and are great quality in terms of production and paper. I generally use them for drawing or mind mapping. The paper is often perforated as well. Kokuyo - Another Japanese notebook, I find them great to write in on the go and they come as refillable notebooks as well. In terms of pens, I do enjoy KawecoSport fountain pens, and Lami Safari for quick writing sessions. Most of my journals and notebooks.